On Thursday night, NFL Week 10 betting kicks off with a solid matchup between the Carolina Panthers and Pittsburgh Steelers. The Steelers are 4-point home favorites, having won four straight both SU and ATS. The Steelers have dominated this matchup with five straight wins against the Panthers SU and six in a row ATS. Carolina has won three straight SU and ATS. However, they have a tough time on the road, where they’re 1-5 SU and 2-4 ATS in their last six. On Sunday, fresh off their upset win over the Los Angeles Rams, the New Orleans Saints face the Cincinnati Bengals as 5-point road favorites. The Saints are on a seven-game winning streak SU and they’ve won six straight ATS. They’re a strong 5-1 SU and ATS in their last six games away from home when laying points. Cincinnati returns from its bye week having lost three in a row ATS. However, the Bengals are 3-1 SU and 4-0 ATS in their last four as home underdogs. The Los Angeles Rams are coming off their first loss of the season but they’re still double-digit faves at home against the Seattle Seahawks this weekend. LA is a disappointing 1-4 ATS in its last five, and the club edged Seattle 33-31 as a 7.5-point favorite in Week 5. Seattle is 1-5 ATS in its last six on the road versus the Rams. They are also 2-8 ATS in its last 10 as a double-digit underdog. In a key NFC North matchup this week, the Chicago Bears host the Detroit Lions as 7-point chalk. Chicago has been a solid pick as a favorite lately, at 6-1 SU and 5-2 ATS in its last seven. Detroit is 9-1 SU and 5-4-1 ATS in its last 10 versus Chicago. In its last five on the road overall, the Lions are 1-4 SU and 3-2 ATS. In a playoff rematch from last season, the New England Patriots face the Tennessee Titans and are the books have them giving seven points. The Pats have won six straight at 5-1 ATS, but they’re 3-3 SU and ATS in their last six road games, all as favorites. Tennessee lost to New England 35-14 as a 13.5-point underdog last season. Against New England, the Titans have lost seven straight at 1-6 ATS. 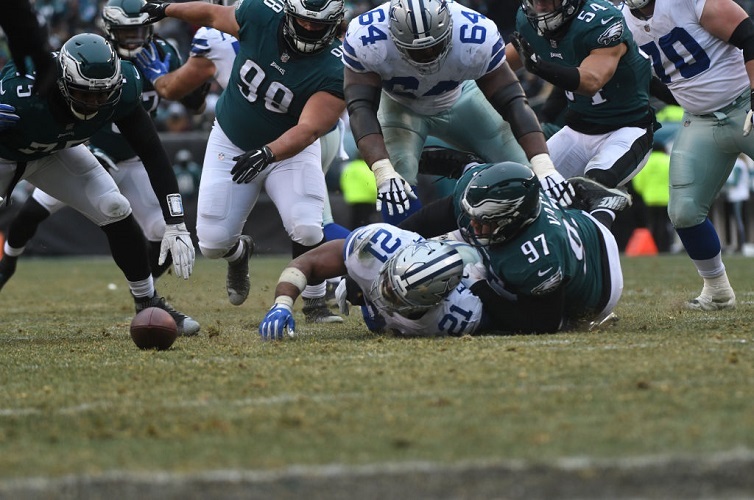 NFC East rivals clash on Sunday Night Football this week as the Philadelphia Eagles host the Dallas Cowboys. The books list the defending Super Bowl champions as 6-point faves, but the Eagles are 0-3 ATS in their last three at home. The Cowboys are 5-1 SU and ATS in their last six trips to Philly. The NFL Week 10 odds concludes Monday night with a potential dud between the New York Giants and San Francisco 49ers. The 49ers are a 3-point favorite, but in their last 13 games when favored, they’re 5-8 SU and 1-12 ATS. New York is 2-12 SU and 6-8 ATS in its last 14 games. Against the 49ers, they’ve dropped three straight ATS.